Watercolour depiction of the jetty at Port Noarlunga. Signed 'J.H.A' in the left bottom corner, with the date '1855' in the bottom right corner, the painting is finely detailed and contains a wealth of information. The jetty extends from an escarpment, on top of which is a man with a horse and wagon; on the jetty itself are four men, a dog and a number of parcels and bundles at the end. 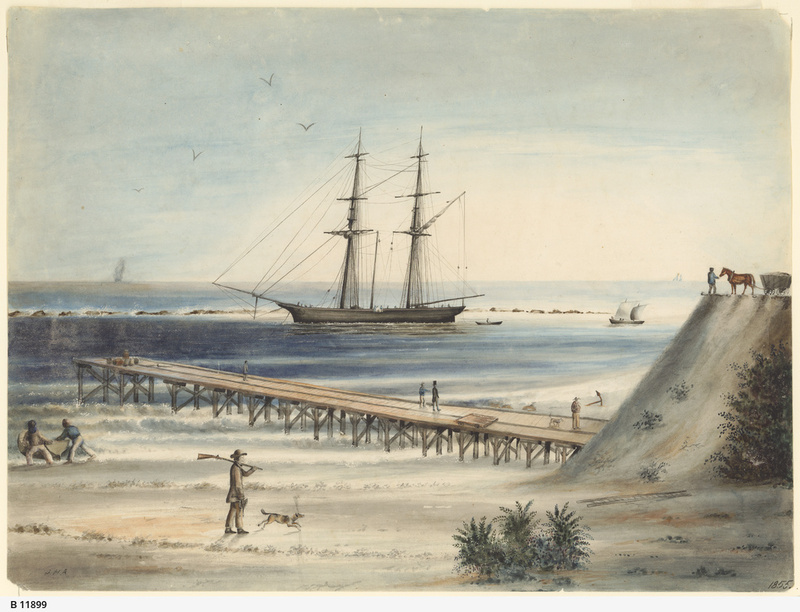 Beyond the jetty is a ship at anchor (the ship has been identified as the 'Yatala' by shipping historian A.D. Edwardes), with a row boat and a small boat under sail nearby; a line of rocks is shown beyond the ship and two other vessels are depicted in the far distance. In the foreground are two men launching a small boat into the waves; another man is walking towards the escarpment with two dead birds in his hand and a rifle over his shoulder, with his dog running ahead; a ladder is also lying on the ground. Born 27 June 1829 Hawick, Roxburghshire, Scotland. Died 2 May 1902 Goodwood Park, Adelaide. Worked in Adelaide and then Melbourne and Sydney before returning to Adelaide. Portrait and marine painter and lithographer.